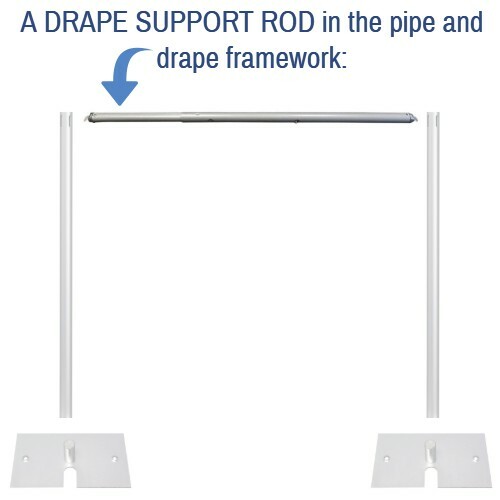 Drape support rod (crossbar) adjusts in width anywhere between 7 feet and 12 feet wide. 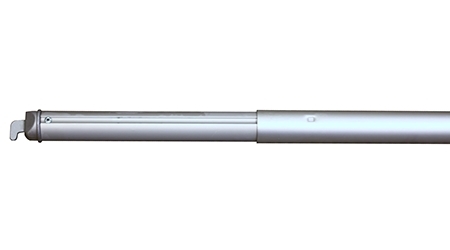 Button stop locks the width at 8 feet, 10 feet, and 12 feet for quick measuring at the most commonly used widths. The rod remains sturdy even when extended to full width and holding three panels of drapes. Make sure to extend the rod to the intended width before putting on the panels - otherwise it becomes a difficult guessing game. I needed my booth to have some flexibilty as far as size goes. These poles did the job perfectly for me. 10' or 12' booth. They held the drapes perfectly. NO ISSUES!!! This support rod bowed when extended to 8 feet. After it was extended to 12', it bowed dramatically. 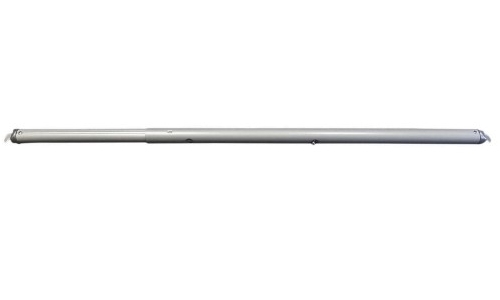 Definitely consider strengthening this product or offer a solution for the bowing of the rod when it is extended past 7 feet. Reply from PipeAndDrapeOnline.com: Hi Ryan, thank you very much for your feedback, and we're really sorry to hear that you are having an issue with your support rod. Please let us know if the weight that you're hanging is within our recommendation of 15 lbs. or less. We're not sure how much weight is being used on the crossbar, as your order contained pipes and bases, but no fabric. The pipe shouldn't bow at all when used to hang 15 lbs. or less, so we certainly want to know if you're experiencing this issue even when using it within the recommended weight capacity. Please contact us at your convenience; we're always happy to assist. Thank you again for your input! Its seems a good product, nice finish and came properly packed. But for expanding the pipes, the little button that spring up into the hole does not work properly. When you bring the hole directly above the button, it is supposed to pop up into the hole to stay at the desired length, but the button does not pop up on its own. I have to wiggle it with a sharp object to release it to pop up. It is the case with all the 4 pipes.. I hope you understand what I am saying. I think the spring that pups up the button does not work well. I have not used the pipes yet at my trade show booth, which I will be doing next week when I set up my booth. Reply from PipeAndDrapeOnline.com: We really appreciate the feedback! The button stop is certainly intended to pop-out when it gets to one of the holes in the Support Rod. Our apologies that they are not functioning in that manner -- we'll be shipping you replacements today. Thank you again for taking the time to let us know! This is a very good quality product. We love it, it's looks very chic. The service was very good and we received it on time. Loved the overall experience. 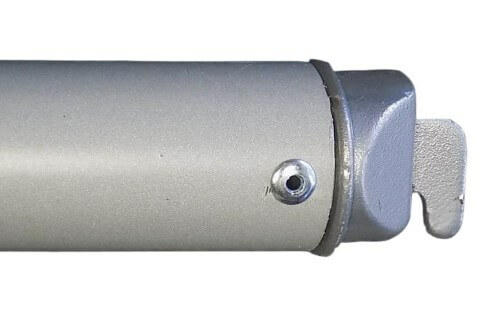 Q: Do I have to purchase two (2) of these support rod to complete a set up or is it sold in pairs? Looks like you have to place one on both end of the pipe. Please explain. Q: What is the diameter of the support rod? Weight (Approximate, Each): 3 lbs. 13 oz.